The Irish Workshops were held in the Adult Learning Centre in Newcastlewest, Co Limerick and they commenced as an evening class on Tuesday 16th October 2018. The participants were a fabulous group of Moldovan, Romanian, Russian and Portuguese most of whom work together in a factory in a neighbouring town. The sessions were weekly and we were able to combine our workshops with an allocated evening language class scheduled for these participants. Our workshops were facilitated by Alex McKillican as the course tutor and Claire Russell as the nutritionist. Valerie McGrath and Kristin Brogan also assisted in the facilitation of the workshops. The practical side of cooking together was combined with the theory part of the guide. The highlight of the workshops was the eating together at the end of each session. The last workshop was held in week eight and was accompanied by some German Christmas sweets by Kristin and various festive traditions were discussed based on the diverse cultural background of the participants. Valerie McGrath was responsible for the recording of the digital stories and we will have five digital stories available and a “welcome” note by the tutor Alex. Overall all participants are very pleased with the results of the workshops and the shared experience. H ομάδα Healthnic Diet εύχεται σε όλους Νόστιμα Χριστούγεννα και ένα Healthnic Νέο Έτος. Απολαύστε τις Χριστουγεννιάτικες διακοπές σας γύρω από ένα τραπέζι αρκετά μεγάλο για όλους. We are happy to announce that the HEALTHNIC DIET workshop that was organized in Poland was a complete success. Participants was eager to listen, learn and practice, as well as share, discuss and engage in all workshop activities. What happened during our sessions? The first session was about getting to know each other and learning about the benefits that the workshops will bring. Participants also learned about the impact that certain diets have on humans, as well as how to choose ingredients to make a healthy meal. The second session was about food traditions in Poland. This was when participants shared their experiences and spoke on the selection of both traditional and tasty dishes. Much time was devoted to instruction on how to select the best ingredients, with the presentation of fruits, vegetables, wheats and many more, brought by workshops participants. The third and fourth sessions were concentrated on putting knowledge and skills into practice. Participants were engaged into preparing healthy dishes. However, first they precisely divided ingredients for each dish and discussed the nutritious value. Use was made of cooking books that participants shared among one another. Then came time for the cooking. The fifth session was a summary of the workshops, gained knowledge and newly acquired skills. For this purpouse introduced was the idea of digital stories. Participants learned how to create own digital stories and became familiar with those already available on the HEALTHNIC DIET website. This allowed for starting works on the creation of own digital storytelling on the topic of Polish dishes and the celebration of traditional Polish cuisine. Workshop participants will meet once again to review the digital stories, to afterwards publish the most creative one on the project website. 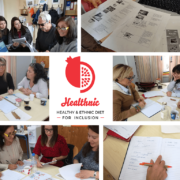 The Greek Healthnic workshop finished its sessions on Tuesday 4th December. The second part of the workshop was dedicated on the digital storytelling process. The participants with the help of their facilitators were divided in 3 groups and created 3 stories that reflect ideas from all the members of the groups and also one more which is produced by all the participants. In order to do that they recalled childhood memories, previous experiences but also moments from the cooking part of the workshop. They had the chance also to learn and practice on how to create a storyboard, to record their voices and use an editing programme in order to create their video. In the final day emotions flowed easily and everybody, participants and facilitators, expressed their great content about the whole experience. 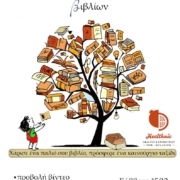 Next meeting for everybody will be the annual Book Bazaar of Vardakeios School on Saturday 15th of December where we are going to project the produced videos and the participants are going to prepare appetizers for the guests and inform them about the Healthnic Diet project. Η Βαρδάκειος Σχολή διοργανώνει το Ετήσιο Χαριστικό Παζάρι ελληνικών και ξενόγλωσσων βιβλίων το Σάββατο 15 Δεκεμβρίου 2018 στις 18.00. Κατά τη διάρκεια του παζαριού οι συμμετέχοντες του Healthnic Diet εργαστηρίου θα προβάλουν τα ψηφιακά βίντεο που δημιούργησαν στο εργαστήριο και θα ετοιμάσουν επί τόπου κρύα πιάτα. Επίσης θα δώσουν πληροφορίες στο κοινό για το πρότζεκτ. 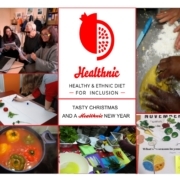 28 November, Merseyside Refugee Support Network’s fifth and final Healthnic cooking session. Before embarking on cooking the dishes that participants planned at the last session, there was a discussion and activity which aimed to deepen and expand knowledge of the many ways to use herbs and spices in cooking. 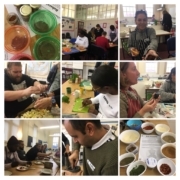 After researching herb and spice combinations essential to many cuisines across the world, each group produced a specific combination – Jerk seasoning (Caribbean), Garam Masala (Indian subcontinent) and Baharat (Middle East) – grinding a mix of spices with a pestle and mortar (new words for some participants towards overcoming language barriers and building the glossary). Everyone had a mix to take away to inspire and enhance their everyday cooking at home and share with friends and family. Participants developed an increased awareness and knowledge of spices and combinations including those regularly seen on supermarket shelves. The activity further strengthened the sense of community with the group. As beautiful aromas filled the air, individual stories and memories about childhood and home were shared about tastes, smells and feelings which engendered a sense of security and pride about home. By sharing memories and focussing on similarities across cultures and countries an appreciation and understanding of all cultures was enhanced developing a greater sense of inclusion for all. Cooking the final intercultural meal began with participants relaxed and enjoying the experience, incorporating all the knowledge from the previous sessions about healthy eating, nutrition, diversity and affordability. 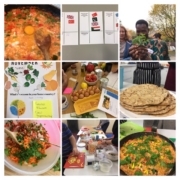 Healthnic brought diverse communities together but was not just an exchange of cultures and cuisines it was a vehicle to learn and reflect about the health benefits of new and older recipes transforming the taste and diversity of each culinary dish. 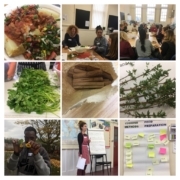 21 November, Merseyside Refugee Support Network’s fourth session of the Healthnic workshop was jam-packed with activities, planning, reflection, learning and cooking with a focus on maintaining a healthier diet. So, to give energy levels a boost participants formed three groups (‘carrot and ginger’ – immunity boost, ‘beetroot and lemon’ – immunity boost and ‘kale and lime’ – moisture and detox) and made a juice cocktail from vegetables, herbs and spices. A significant quantity was produced so everyone could savour a shot of each distinctive cocktail. All that was needed were the disco lights, as the atmosphere buzzed with discussion about individual taste preferences. The sweetness of the blood red beetroot shot took it to the top of the charts, whilst the bitterness of the pea green Kale shot came last. Now super energised, knowledge on the properties of herbs and spices was presented including information about how herbs and spices help maintain vitamins and add flavour. In groups stories, reminiscent of a cherished childhood meal were shared, fascinating tales including the Caribbean breakfast of blue crab, callaloo and bread fruit. These reminiscences informed how particular foods, herbs and spices have come to influence flavours and tastes across cultures and generations. Next, in an individual exercise, participants reflected on their personal diet and considered changes that could be introduced towards a healthier eating regime and its value. Returning to group activity, participants used a recipe board to plan and cost ingredients for a dish in the final cooking session next week. Prime consideration was given to healthy, nutritional and affordable foods. 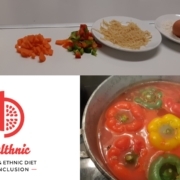 With the consideration of Healthnic’s inclusion goal each participant modified the dishes with a culinary influence from their own country. Finally, it was time to cook and eat. 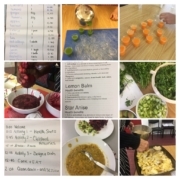 Today, each group was produced a different course for lunch using local and seasonal produce flavoured with herbs and spices. Socialising over the meal of vegetable soup, beetroot salad and apple, cinnamon and nutmeg crumble everyone conferred about the benefits of whole grain over “white” grain and reflected on the cost of the ingredients for each course, reinforcing the question of affordability, nutritional value and importantly of taste, when using fresh local and seasonal ingredients linked with nutritional value and taste. The third session 14 November introduced herbs and spices with a focus on culinary and medicinal uses. All together we talked about how we used herbs and spices. 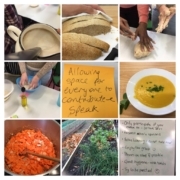 In three groups – Chives, Parsley and Coriander, our first activity matched a spice and herb with a description of its medicinal properties as its health benefits. Spontaneously stories were shared about natural remedies that have been handed down through generations “from home” and are still used today. Our facilitator Rosie, asked everyone if they could identify the contents of a small jar of herb salt (basil, garlic and raw salt) through smell and taste. Then in a group activity we chose a cocktail of herbs from the garden considering taste preferences and medicinal qualities – for example – mint, calendula petals, garlic and salt. Everyone had their individual jar of herb salt to take home, store for a week in the fridge and use. Preserving herbs this way allows them to be used like a stock cube. 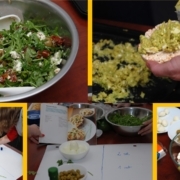 Next, each group prepared a seasonal salad with their group herb (chives, parsley or coriander) to be the dominant flavour – transforming its taste of season. The salads were served with baked potato and Ali’s delicious tomato smoked beans flavoured with garam masala and smoked paprika, a cheap and nutritious autumnal meal. The discovery of new tastes and unusual flavours in today’s lunch drew consensus that previously held reservations about using herbs and spices in home cooking were to be abandoned. After eating we were joined by Ewan and he introduced the group to digital storytelling. He showed examples of several two minute digital stories created in the Erasmus+ Tell Your Story 2016 project. This helped our participants focus on their own stories in a context of food. November 7, we returned to the John Archer Hall kitchen for the second session of the Liverpool Healthnic workshop. This day focussed on using seasonal and local vegetables. Three groups were formed, each with diversity of participants, for an activity to identify which English vegetables were in season throughout the year. This exercise was enriched with information about differences in duration of the seasons and seasonal produce from the various home countries. November is a season of abundance in England so we have plenty of fresh and economic vegetables available. In our next activity, we created a recipe board for a dish influenced by each member of the group. The predominant ingredient used by the three groups was tomato because of the abundant harvest available from the community garden – combining economy and nutritional value. Each group chose a dish to cook and illustrated the influences with national flags. A traditional Turkish tomato omelette (menemen) was cooked in a frying pan with vegetables and eggs and given an English finish by grilling the top until the egg was cooked through, served with a Sudanese Peanut salad and Pakistani chapati. Sharing ideas, working together and eating together is enhancing the bonding of our Liverpool Healthnic family. It was the last day of October and the first day of the Liverpool Healthnic workshop at the John Archer Hall based in the heart of the Toxteth community. Session one began with introductions and all together we shared with what we had for breakfast – tea and toast the most popular start to the day! We began to build group relationships through open discussion with a few icebreakers, using pieces of fruit (healthy eating being a focus of the day) and learnt a little about each other. In groups we exchanged ideas about the essence of our diverse traditional cuisines with the similarities that exist across ‘borders’ transpiring naturally. All together we discussed and agreed joint aims and rules for our sessions to create an enjoyable, respectful and safe experience. in groups, we began baking bread. This was a bonding as well as educative activity in which we shared expertise, tips and stories. With sticky fingers, we learnt more about each other, and worked out stretching and pulling until the dough was smooth and ready to shape and bake. While the bread baked, we explored the John Archer community garden and picked coriander to add to the soup that was provided for lof unch and mint for tea. As everyone was smelt and tasted the wide variety herbs, memories and stories flooded out with stories from England, Pakistan, Turkey, Sudan, Tobago and Burundi. As we returned to the kitchen the beautiful aroma of baking bread whetted our appetites reminding us it was time for lunch. The bread was sliced into ‘doorstep’ chunks and served with a bowl of nutritious carrot and lentil soup. Over lunch, our Heathnic community continued to discuss the essence of our cuisines and agreed plans for the next session.